Settling into your new dorm room is one of the most exciting parts of starting a new school year at college. It’s fun to personalize the space and make it your own. One of the challenges, though, is the limited square footage. At first glance, it can seem impossible to fit everything into a small dorm room, especially if you are sharing it with someone else. But the truth is, it’s all about clever planning! With some creative organization, you can fit everything you need into a small dorm room and not only make it functional, but also make it look super stylish. It doesn’t have to cost a lot to accomplish this, either. There are a lot of great DIY projects you can do to save money and things you can use for multiple purposes to make the most of the space. Here are 10 dorm room organizing ideas that are functional and stylish. 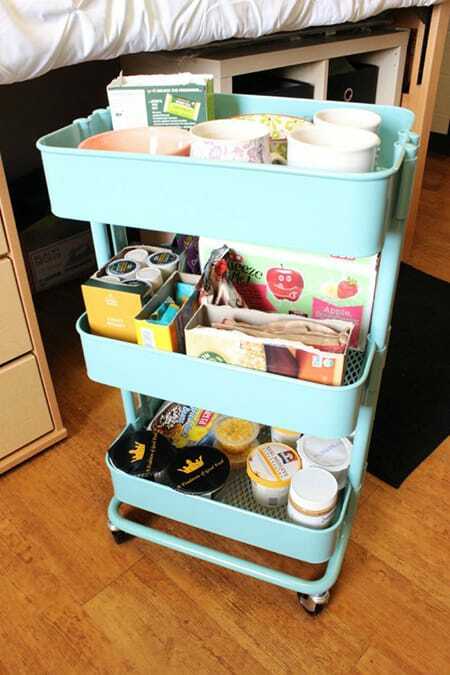 A cute cart on wheels is perfect for holding snacks, cups, and cutlery in a small space. In this room, she actually slid it under a raised bed to keep it out of the way. 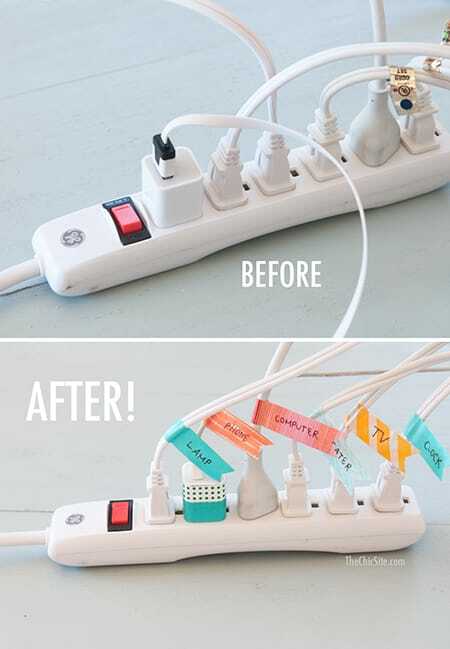 If you have a lot of cords, this is a smart way to keep track of what goes where so you never have any confusion. How adorable is this DIY coffee station? 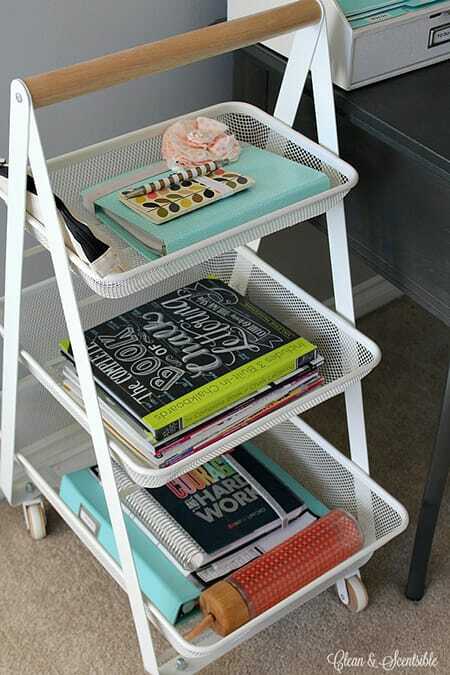 A shelving rack like this is great for holding books, stationery, paperwork, and other important paper goods. 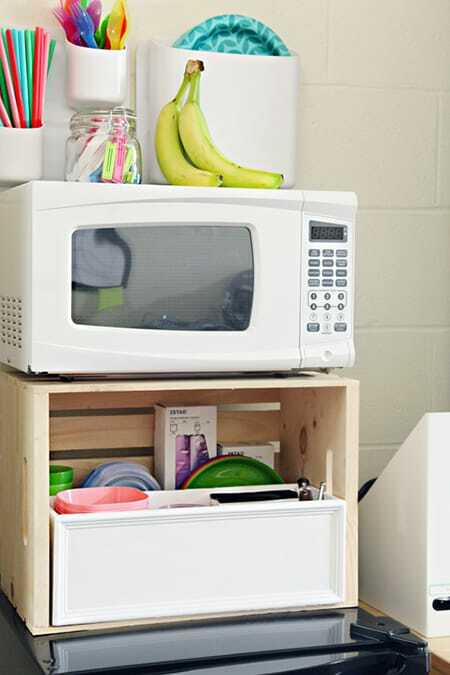 To create more storage space in your “kitchen” area, prop the microwave up on a crate that can hold cutlery and other items. 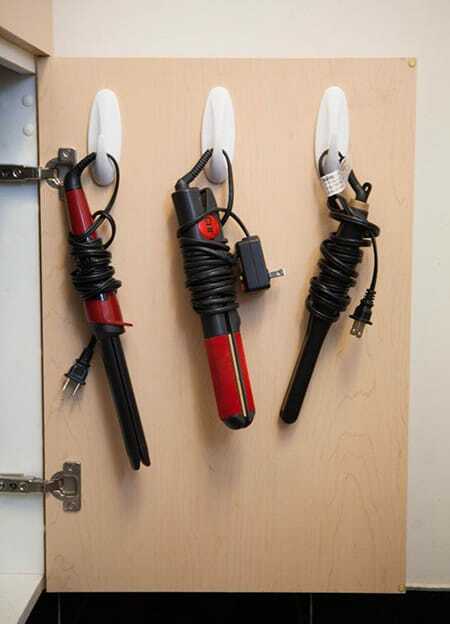 Make use of the back of a cabinet door by hanging up your hair styling irons there. 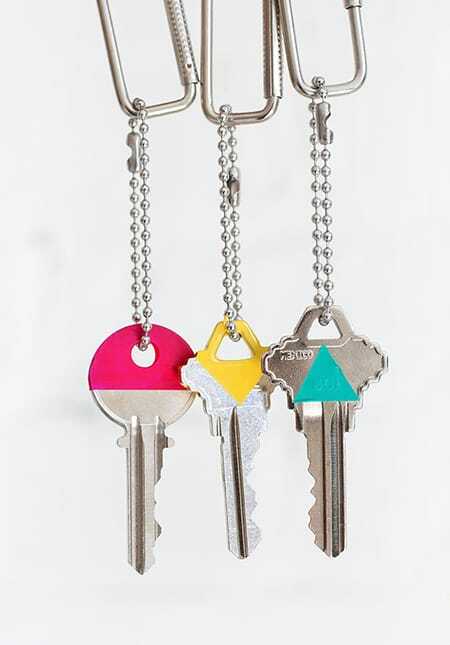 Always struggling to remember what key goes where? Follow this tutorial to paint your keys in charming patterns to help identify them. 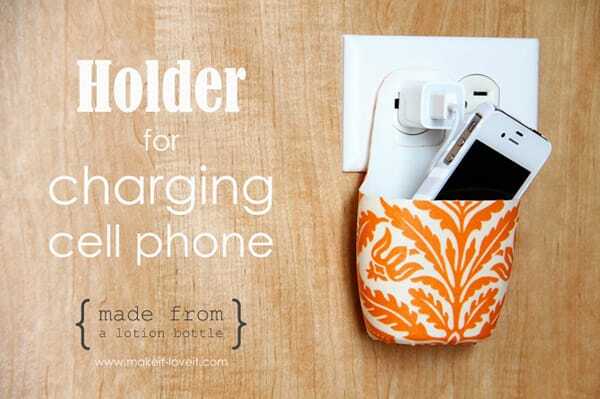 If the outlet is too far from your bed or desk, this holder is a great way to keep your phone safe while it’s charging. 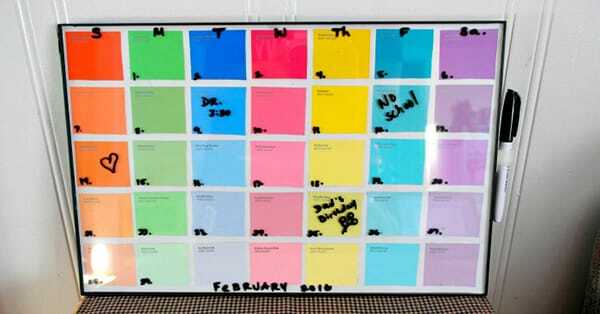 Love this idea for using paint chips to create your own personalized calendar. 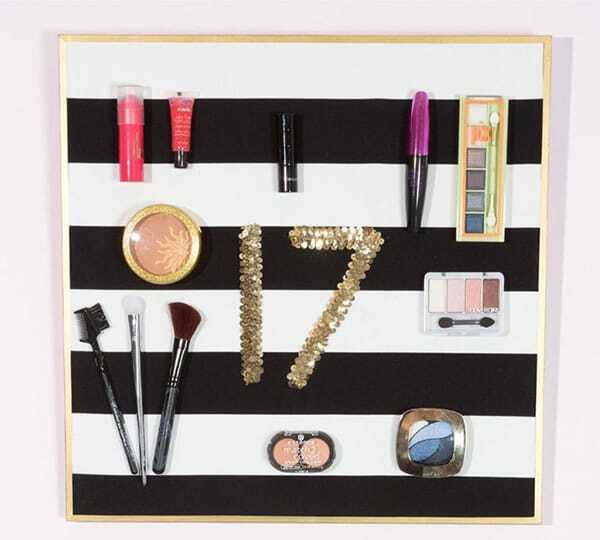 This DIY project shows you how to make a magnetic board to organize your makeup. Genius! So many great ideas to make the most of a dorm room!